Plastic "Jimson" racing car transporter. 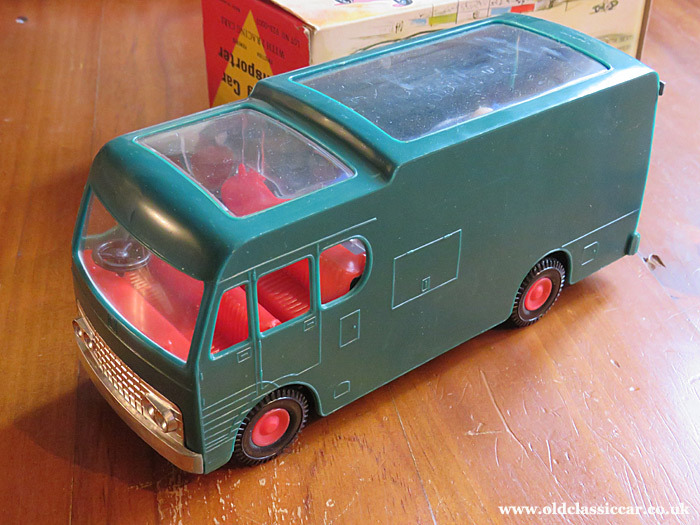 The second plastic toy racing car transporter to feature in this corner of Old Classic Car is the following green example, produced in Hong Kong during the 1960s and sold under the Jimson label. While no make or model name for the lorry itself is given, it looks like a typical Bedford of the era. In 2018 I stumbled across a real transporter that looked not unlike this toy in fact, parked up on a farm and not looking like it was going anywhere anytime soon. Maybe a return visit is due. Anyway, this toy version was found at a toy fair years ago, and having an interest in this kind of thing, it was swiftly purchased and stowed away in my bag. In some respects, the artwork and design of the box shows at least as much - if not more - imagination than went into the toy itself. This example appears to have been rarely - if ever - played with, and the box has survived in good condition. The transporter itself has friction drive to its front wheels. The baseplate bears the maker's name - Jimson - plus a number (122) and "Made in Hong Kong", as so many plastic toys of the 1950s/1960s/1970s were. The rear ramp hinges down, revealing the dual-level stowage area for the two plastic toy cars that accompany the lorry. Other than also bearing the country of manufacture, the cars have no more information on them. The lorry measures a smidge under eight inches in length. A sheet of transfers is included, although whether they're original to the set I don't know. They don't match the artwork on the box, but it's not unfeasible that two (or more) versions of the toy were produced, perhaps to update it, but retaining the original box artwork design. 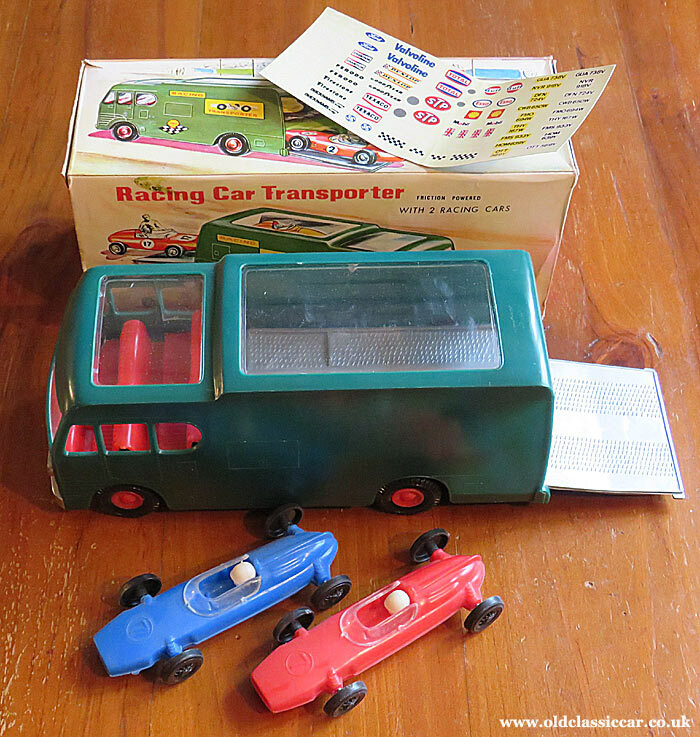 The registration numbers on the sheet are for a much later date though, so my suspicion is that originally the decal sheet belonged to another toy set, or even a kit, rather than this toy transporter. I wouldn't mind acquiring a correct set of the Jimson transfers/stickers for this toy. Jimson appear to have produced quite a range of commercial vehicles over the years, including lorries and coaches, in addition to other toys. 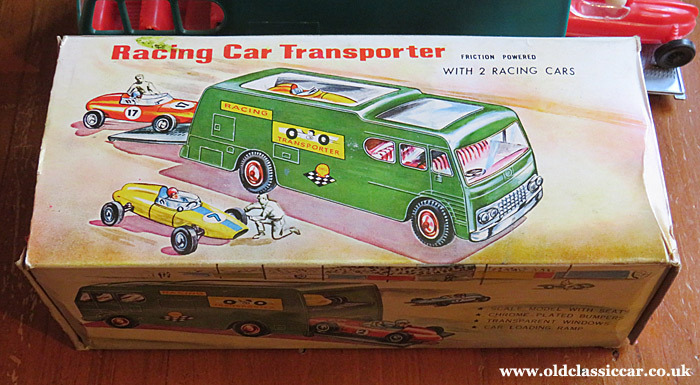 I've also seen this toy sold in a box with artwork of earlier, front-engined, racing cars, as opposed to this example with its rear-engined F1 cars. 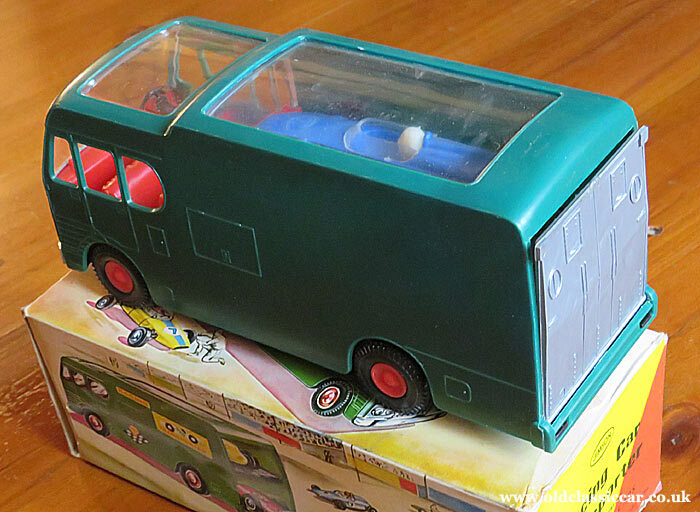 Anyone more familiar with British-produced toys may well recognise the overall look of this vehicle, as it appears to be very very closely based on Matchbox/Lesney "King Size" transporter's design, also from the 1960s.